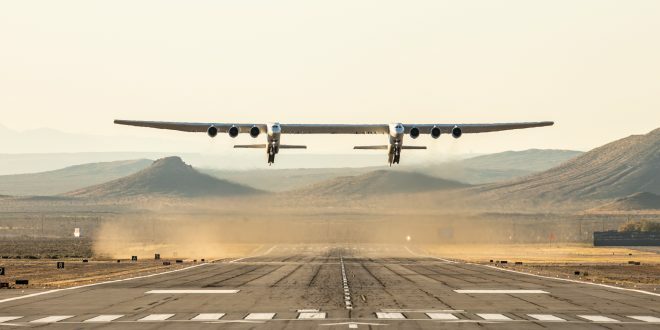 The world’s largest plane by wingspan took its first flight on Saturday above the Mojave Desert in California. The plane was built by Stratolaunch Systems, which was created in 2011 by Microsoft co-founder Paul Allen. By launching rockets, satellites and other spacecraft from the sky, the company is betting it will be able to avoid the types of delays that ground launches are prone to, such as bad weather. “I’m really excited today to share that we have successfully flown the Stratolaunch aircraft for its first test flight this morning,” Stratolaunch CEO Jean Floyd said during a press briefing. “It was an emotional moment for me to personally watch this majestic bird take flight and to see Paul Allen’s dream come to life in front of my very eyes.” Allen died in October. The company says it wants to begin launching rockets from the Stratolaunch by 2020 at the earliest, according to Reuters. But while it works toward that goal, it also faces competition from the likes of Elon Musk’s SpaceX and the United Launch Alliance. Though the company isn’t ready to launch anything just yet, Saturday’s flight was considered a success by many, including test pilot Evan Thomas.